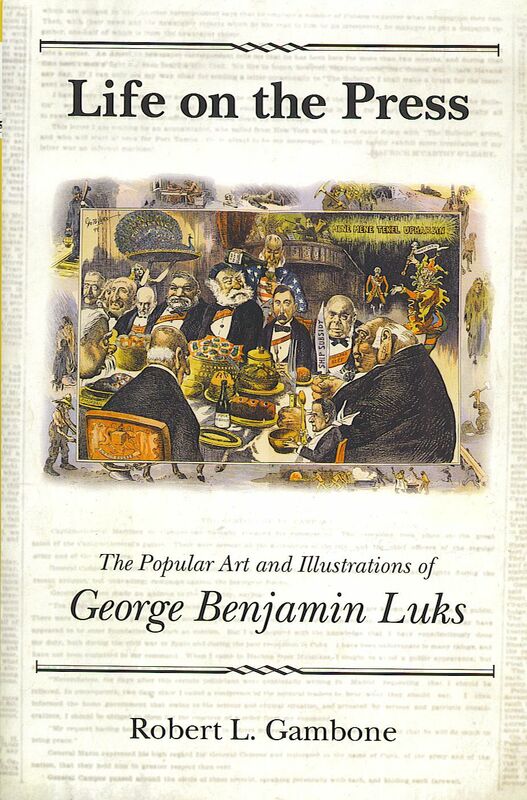 Gambone’s book, which seeks to recap George Luk’s life as an illustrator, was published so far under the radar that I didn’t stumble across it until just a few months ago, two years after it was published. Of course I ordered it immediately, because the subject is right up my alley. Anything about the work of a cartoonist who was in the thick of the Sunday funnies phenomenon of the 1890s is like manna from heaven. 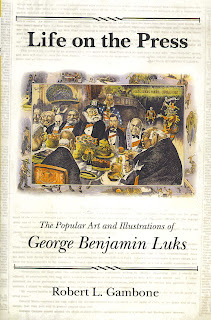 Of course I do realize that the book would not have seen the light of day had Luks not been famous as a painter, but the blurb reassured me that this book is about his illustration and newspaper work, not his ‘fine’ art. And so it is. Although Gambone certainly does discuss Luks’ fine art here and there, he does an admirable job of sticking to the task he claims to be tackling in the title of the book. So huzzahs on that account to Gambone. And huzzahs again for the thoroughness of coverage, because Gambone discusses many of Luks’ cartoons and illustrations in detail as to style, subject and background, and mentions seemingly practically every major piece he did for a newspaper. So regarding sticking to the subject and covering it thoroughly I give the book an unmitigated thumbs up. Beyond that things unfortunately go downhill. My problem with the book is that I found myself mistrusting Gambone’s judgment about Luks’ artwork. In a book as sparsely illustrated as this (keep in mind this is no coffee table art book) it is quite disconcerting to find yourself wondering if the author is really able to judge and explain a piece of artwork realistically and accurately. I first became concerned early on in the book when Gambone discussed a minor little multi-panel cartoon produced for Puck. This is a strip that is fairly well reproduced in the book. In it we see a dapper rich kid holding a balloon encountering a tough-looking street urchin. The urchin, who is smoking a cigarette, gives the kid a disdainful look and pops the balloon with his cigarette. Panel three finds the pair in a tumbling wrestling match, and in the final panel the foppish rich kid is stalking away with the tough kid’s cigarette perched victoriously on his lip while the urchin slinks away, bloody and cowed. Gambone makes much of a perceived difference in the way the two kids are drawn. He feels that the rich kid is “merely an outline” whereas the urchin is “carefully rendered”. Looking at the strip, at least as it is reproduced in this book, it certainly looks to me like Luks put the same amount of effort and detail into both kids. Certainly there is more ink expended on the dirty urchin as opposed to the immaculately clean rich kid, but it takes more ink to show soiling than it does to indicate cleanliness. Bringing this up would be hairsplitting, except that Gambone uses this perceived difference in the drawing to jump to an utterly ridiculous conclusion. He claims that the quality of the drawing on the urchin proves that it could only have been drawn from life and “this drawing demonstrates that at least three years prior to starting as a newspaper artist-reporter in 1894, Luks developed the habit of strolling about inner-city neighborhoods observing, sketching and devising compositions.” Even if there were a vast difference in the quality of the drawing of the two kids, a difference I certainly don’t see, drawing such a conclusion is like saying that Alex Raymond must have visited Mongo since he drew the creatures of that world so convincingly. While I certainly don’t discount the possibility that Luks might have been sketching street urchins, I can offer a much simpler explanation for a cartoon in which the two characters seem to have a stylistic difference. How about this — the cartoonist was swiping from different sources for the two characters and didn’t make the effort to adapt them to a single unifying style. For the remainder of the book, now having established his credentials as a spotter of such things, Gambone tells us with assurance many instances when a drawing must have been sketched from life. Another instance when the author’s logic in this regard is highly questionable comes with an illustration from the New York Sunday World. The subject is bosses who take their secretaries to lunch, and Luks contributes a large illustration of a restaurant, filled with older men dining with attractive young women. According to Gambone, who notes that the dresses and varying body types seem fully realized, and that the furniture is of a specific design, concludes that the “degree of veracity indicates the World assigned Luks to dine at this establishment and record the scene or else had a photographer make a candid shot that served the artist as an exact model.” Oh come now. First of all, any newspaper artist worth his salt could produce such an illustration without moving an inch from his drawing board — artists were not employed by newspapers if they needed the crutch of live models in order to make a simple story illustration. Second, the illustration depicts a restaurant populated ONLY by twosomes, each consisting of a man and a gorgeous young lady. What are the chances of this ever happening in real life? What, not a single pair of guys or girls going out to lunch? No table just happens to have just a single person or three? The chances against such a congregation of businessmen and their secretaries is astronomical. Third, the women are dressed in such high style my guess is that they were copied out of a Godey’s Lady’s Book — it seems very doubtful that a secretary would wear such finery to go to work or could afford to, even if they were the boss’ ‘special favorite’. And finally, for all the vaunted realism of the scene, Luks has made a royal mess of the perspective. If he were sketching from life, surely he was a good enough artist to not make such a mash-up of the drawing. These are only two examples, but they’re not the only ones. Look, I don’t much care whether Luks sketched a given scene from life or not. To me it’s not really an important distinction. However, I cannot help but wonder how often Gambone is leading me down the garden path about all sorts of details of Luks’ other drawings, the ones that aren’t reproduced in the book.Without an illustration which I can judge for myself (which is often since there are few illustrations reproduced), how much of Gambone’s description and interpretation should I believe? Also, to be a bit nitpicky, the book would have benefited from the services of a good proofreader. I don’t blame Gambone for the many slip-ups I noted, because everyone has a few holes in their knowledgebase and fingers that sometimes type faster than the brain functions, but a proofreader certainly should have caught the instances of “grizzly” for “grisly”, “ground-braking” for “ground-breaking”, “sheers” instead of “shears”, “lodge” instead of “loge”, and so on. I am impressed and enthused that people from the fine art world would see fit to look beyond Luks’ paintings and delve into his commercial art career. Cross-pollination like that is thrilling to me, because I myself rarely think of cartooning in terms of just the lines on the paper or the stories that are told. I am fascinated by the whole universe of thoughts, events and viewpoints that swirl around every piece of newspaper cartoon art. The world reflects the art, and the art reflects the world. To read the perspective of someone like Gambone whose specialty is in fine art is instructive, as so are the perspectives of other disciplines when they intersect with my own personal passion for the history of cartooning. We can all learn something from each other, and increase the sweep of our perspective accordingly. The fact that I think Gambone’s book fails on some counts is nothing compared with my delight that this kind of book is being published. More, please more! This entry was posted in Stripper's Guide Bookshelf by Allan Holtz. Bookmark the permalink.